One of the benefits of digital comics? You can drop a surprise series and immediately customers will be able to buy it. That’s the case with Stone Star, a ComiXology Originals miniseries from Jim Zub and Max Dunbar. The first of five issues debuted just today, so check out the preview below and head to ComiXology to snag yourself a copy. What’s more, Zub and Dunbar will be in attendance at WonderCon Anaheim to discuss the series, so check out the schedule in the details below. 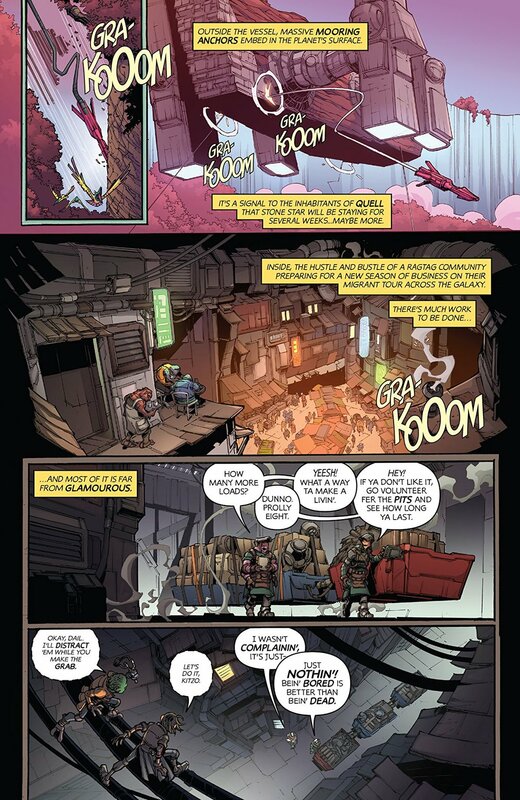 March 27, 2019  New York, NY ComiXology, Amazon’s premier digital comics service, dropped a surprise new series today, the first issue of Stone Star, a 5-part sci-fi, action-adventure comic seriesby Jim Zub (Champions, Avengers: No Road Home, Rick and Morty vs Dungeons & Dragons) and Max Dunbar (Champions, Dungeons & Dragons). Stone Starissue #1 is digitally available to read now for members of Prime Reading, Kindle Unlimited, and comiXology Unlimited and is also available for sale on comiXology and Kindle for $2.99. The biggest news in comics is comiXology’s exclusive digital content program - comiXology Originals. Now you can join comiXology’s Head of Content, Chip Mosher, writer Jim Zub and artist Max Dunbar to get the scoop on an all-new, recently announced, comiXology Originals series, Stone Staravailable nowdirect from the creators making it! They’ll wow the crowd with stories on the process of bringing creator-owned comics to life and what it’s like pushing the envelope with digital comics, and beyond. Like with any creative field, Comics is a tough business to break into, and possibly tougher to stay in  but fear not! Our panel of comics veterans from across the creative & administrative spectrum of comics are here to help! Join our panel of comics superstars including Jim Zub (Avengers, Dungeons & Dragons), Max Dunbar (Champions, Teen Titans), Chip Mosher (comiXology Head of Content), Ivan Salazar (comiXology PR & Events) & surprise special guests as they teach you the tricks of the trade to break in & stay in comics, possibly for LIFE. Welcome to Comics, hope you survive the experience. Just getting into comics but not sure where to start? We can help! Hear from some of the industry's best & brightest including Jim Zub(Avengers, Dungeons & Dragons), Max Dunbar (Champions, Teen Titans), Mark Sable (The Dark, Graveyard of Empires), Bis Stringer Horne (Comics Editor & Facilitator), Ivan Salazar (comiXology PR & Events) & more special guests as they impart their vast comic knowledge by personally recommending series just right for you! Join the eternal comics fans at comiXology along with a riveting panel of comics superstars as they become your guides through the awesome world of comics! Stone Star #1 is available now on ComiXology and Kindle.